Exploration and excitement await on this hands-on, up-close and personal tour of Niagara Falls along with Mackinac Island! 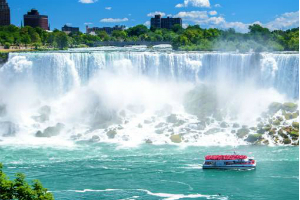 You'll bring home the memory of a lifetime after witnessing over a million gallons of water per minute rush over the cliffs of Niagara Falls, experience the beauty of the butterflies at the Niagara Parks Butterfly Conservatory, and explore the spectacular beauty of Mackinac Island along with so much more. Join Judy's on this nature extravaganza! This escorted tour includes motorcoach travel, luggage handling, 7 breakfasts, 2 lunches, 1 dinner and 7 nights accommodations.